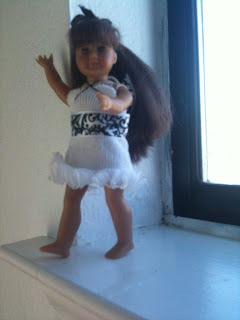 American Girl Mini Doll Style! Hey! MOLLY-ANNE HERE: Remember me? I’m a re-named Mini Molly! 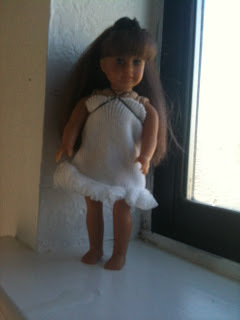 But, hey: I’M NOT JUST ANY RE-NAMED MINI MOLLY FROM AMERICAN GIRL HERE! I am THE Molly-Anne…that belongs to the 18 inch Molly, my owner! LOL! Well, I’m here to bring you the LATEST mini-doll fashion today. I’ll be happily modeling for you, also! Get ready to have the best style EVER! 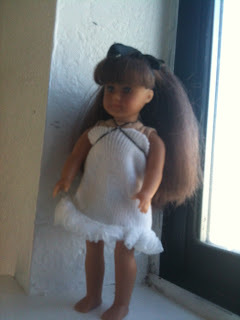 SO, Molly-Anne the fashion model here to bring you the latest mini-doll designer fashion this month! This month’s style is black and white. 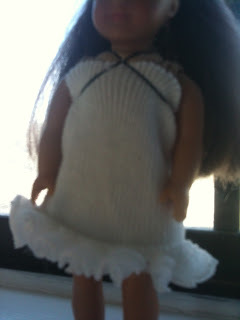 To make a gorgeous and cute dress, get a clean, white, lacy sock. (ALWAYS get an adult’s permission before cutting up clothes.) Cut from the lacy part and down, no required measurements: just how long you’d like the dress to be. After you’ve cut the piece, turn it upside down so the lacy part is at the bottom. 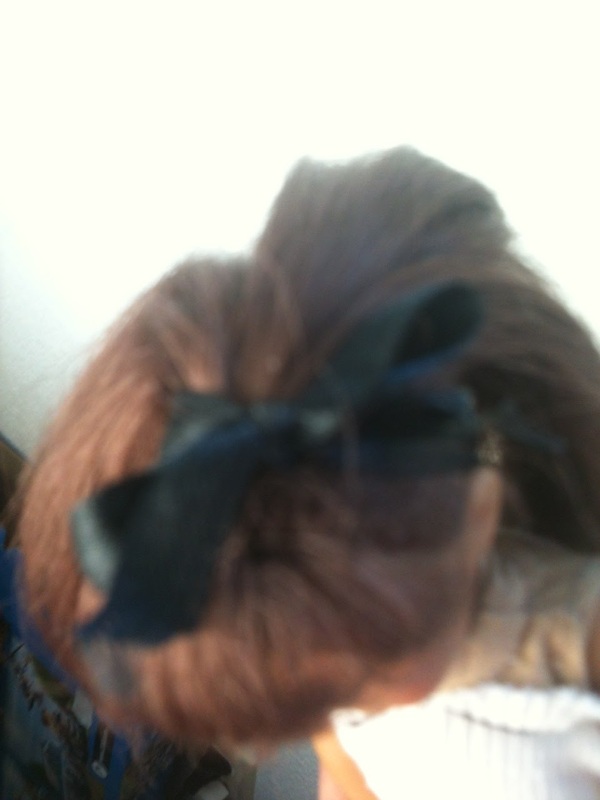 Slip it on your doll, and to keep it from falling down, tie an elastic to it. To complete the girly-girl look, tie a piece of thin, black ribbon into a bow on the top of your mini-doll’s head. ADORABLE! And to bring this springy-time, fashionable outfit together, grab some black-and white ribbon and use it as a sash for your mini-doll. 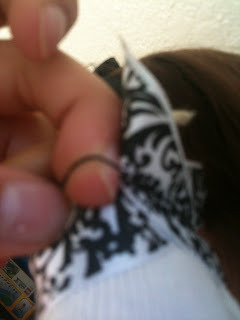 You could tie it in the back or stick the ends of the ribbon under the elastic ‘sash’ like we did. P.S…..behind the scenes pic! hehe! 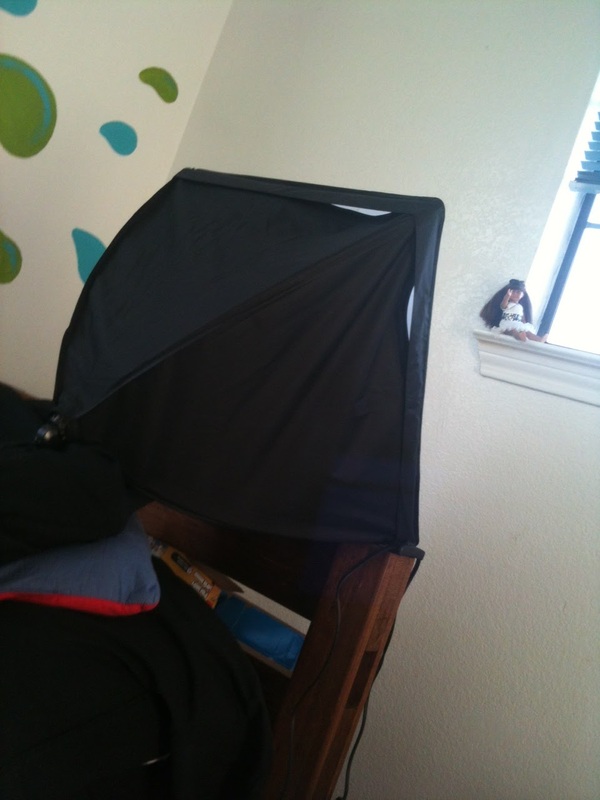 We used this to brighten up all our pictures. ~Molly and Madison, with Josefina and Cecile! What is that giving light? I can’t make it out! LOL! Us: We have no idea!! It’s something that professionals use to give light to their pictures, mom’s dad discovered it broke off the stand, so he gave it to her because her pictures turned out so dark. The reason he has the professional lights is because he’s launching a ministry and he’s going to shoot videos with the professional camera, with professional lights, int he studio, etc. Have an awesome day and thanks for visiting! WE’VE BEEN WORKING ON MY BLOG!!!!!!!!! I’M SOOO EXCITED!! IT’S LOOKING SOOOO CUUUUTEEE!!!!! LOLOL! Thats so cute! But I dont have a mini doll! When I get a mini doll, Ill try it out. Marie-Grace: That is cute Molly-Anne. Hey, you know what? We both have 2 first names! cool! LOL, thank you Vivian! 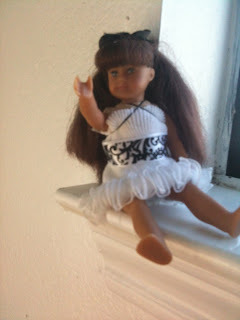 We hope you get a minidoll soon, they are WELL WORTH THE MONEY! Believe me! LOL! Molly-Anne: Wow! That is a coincidence! LOLOL! Hi Jaclynn! Emma’s at the doll hospital getting her head replaced. Marie-Grace: bonjour mon amie! (Is that how you spell it?) It’s nice to meet my twin! We have lots of other sisters! By that I mean all the other Marie-Graces! Who are your sisters? I just have Emma, who is at the doll hospital! Nice meeting you! Au revoir! Vivian: Oh how sad!! What was wrong with it? Marie-Grace: LOL! I think so! I know, there are SO many of us! I LOVE them all so much!! Is your mommy planning on adopting another any time soon? Hey, Molly and Madison, I replied on WE MOVED!!! And, this may be kind of babyish, but I LOST A TOOTH!!! I know, kinda babyish right? But still, I haven’t lost a tooth in a while, so it’s kinda exciting! Marie-Grace: WOW! You have a lot of siblings. Emma’s at the doll hospital getting a new head because her eye is broken, and her face is scratched up kinda. Marie-Grace: I know! But we all get along good with each other so that’s good. Although a couple of the toddlers have their moments- LOL! Oh, Congrats on the tooth!! It’s not very babyish! I’m 14 and still need to lose quite a few more! I think I only lost one last year. I wanna lose some more this year though. I know, it takes SO long! And yes, it is exciting- cause you get some money, LOL! Do you get money when you lose a tooth? Natalie: Owch, sounds painful! How’d she break her eye?- on second thought, don’t tell me, I’ll probably have nightmares 😛 My cousin Josefina got her arm scratched off when we fell on the street in fall. She got the worst of it BUT IT WAS PAINFUL!!! I WAS THERE AND FELL TOO!!! IT WAS NOT FUN!!! Kaya: Gee, Nat, calm down. Mini Sam: Greetings, oh most awesome Mini Molly! Our normal styles are made of tissues or our regular clothes. Mini Ivy: Tell her about the headbands! And it’s not babyish at all! My mom, madison, lost a tooth last month and has 2 new loose ones, and quite the mouthful still to lose! LOL! And poor Emma, I bet she’ll be happy to look good as new when she comes back. LOL, Natalie! THAT sounds painful, too! Molly-Anne: Thanks, Mini Samantha! LOL, Now I am kinda curious to know about the headbands! LOL! ~Molly and Madison, with Josefina, Cecile and Molly-Anne!